Today we had a leisurely walk around the The Plains of Abraham, the battle site of the British Army, Royal Navy and the French Army in 1759. After loosing a battle with the French in Nova Scotia earlier, the British focused its efforts on the St Lawrence River and the key city of Quebec, protected by fortified walls. Cutting to the chase, the Britsh won a landmark victory providing a strong foothold to claim Canada for herself. Some interesting side points. The French had intended to build a Citadel however, were denied funding by the French King of the time, Louis XIV. The citadel seen here was built by the British after they took control of the city and was designed in such a way as to join to the French built Enceinte (city walls). The Quebec Confrences were held in the Citadel to decide on Stragery in World War II. Winston Churchill, Franklin D. Roosevelt, and William Lyon Mackenzie King were in attendance. The battlefields are now a park where many leisure activites take place, we were still able to see people cross country skiing today. 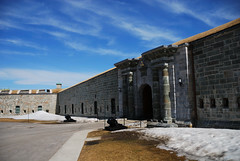 The Citadel is the current base of the 22nd Regiment of the Canadian Forces. From Montreal we travelled deeper into Canada’s history to the city of Quebec, three hours north east on the VIA Railway. Perched on a cliff-face overlooking the St Lawrence River, Quebec has retained much of its old world charm and bustling atmosphere. The old part of Quebec, where we spent much of today, is made up of the Upper Town, contained within the city walls, and the Lower Town which wraps around water’s egde. 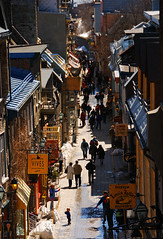 The photo here is of North America’s oldest street, Petite Champlain, lined with houses dating back to the early 1600’s, now filled with cafes and art galleries. Behind Petite Champlain, looking over the old port, is Maison Chevalier, a stately homed once owned by one of Quebec’s wealthy elite. 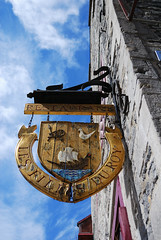 There is a small lane behind the home which because of its close proximity to the waterfront, was regulary used by farmers and merchants to sell their wares. Looking out onto this lane from inside Maison Chevalier it doesn’t take much imagination to know it would have been a very lively place to live. 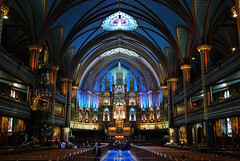 Erected between 1824 and 1826, the Notre Dame Basilica was at the time the largest church in North America. The twin bell towers stand 66m high, the internal height from the floor to ceiling is more than 24 metres. Make sure to click on the photo to see the larger version, the interior is truly impressive. I can’t help but wonder how the designers missed Mathew 5:5 ‘Blessed are the meek, for they will inherit the land’. Their pride does not stop at the paintwork as the enormous organ has over 7000 pipes, no wonder Celion Dion chose to be wed here. We have now seen the Ottawa and Montreal Notre Dame Basilicas, Quebec also has one and of course Paris. We should be able to make a good series of prints following this trip. Montreal is one of the oldest cities in Canada, being founded by the French in 1642. It was originally named Ville-Marie, however after 25 years of growth the settlement gradually became known as Montreal. In 1760 Montreal fell into the hands of the British however this did little to suppress the french influences architectually and culturally. Unlike many other cities that knock down older buildings to make way for more modern more space efficient developments, Montreal has retained its old town and charm. Many of the buildings are open to the public so Simon and I took the opportunity to look at some stunning interior design and to take a break from the wind. The Bank of Montreal (Canda’s oldest bank) had towering marble columns and large ceiling roses and chandeliers. City Hall and Palais de Justice (courthouse) built in the mid 1800’s are also here, topped with green copper domes. The oldest part of the district is home to cafes, restaurants, galleries and museums. The streets are cobblestone and horse drawn carriages still rattle by regularly. Down by the old port the mix of industrialisation and recreation makes for a interesting and pleasant vista, especially as we were blessed with sunny blue skies. As for our french, this is coming along too, we managed to buy two tickets for the subway and a couple of cups of coffee. Last night Simon and I left Ottawa and took the train two hours North East to Montreal. Along the way we practiced a little french as once you cross the border from Ontario to Quebec engish becomes the second language. A friendly train guard assurred us the the main thing to remember is Bonjour, Merci, Excusez-moi and si vous plais. Hello, thank you, excuse me and please. Armed with our four words of French we got up this morning to explore the Downtown area of Montreal. Running through the middle is Rue Catherine, a long thoroughfare lined with shops, nightclubs, fast food and pizza shops. Along our walk we came across the cathedrale Marie-Reine-du-Monde (Mary Queen of the World Cathedral), a replica of the St Peter’s Basilica in Rome built at one quarter the size. The interior was splendid with high ceilings disappearing into three large domes. Given its size I am eagerly anticipating our visit to Rome to see the Basilica four times it size! I am sure you have noticed the influx in the number of churches in our travels. These older cities are full of them and some are among the oldest buidling ins the city, many dating back to the 1800’s. We also tackled the walk up Mount Royal for a far reaching view of Montreal. It wasn’t that high – only 250 steps and a bit of a hill. My legs are still sore but it was worth it to get this view. In the evening it was time to join our fellow travellers from the hostel (including Leah, the friendly German traveller who helped us find the hostel in Ottawa) to explore some of Montreal’s bars. Many of the places where mere holes in the wall and without being shown by our local guide we would never have found them. The 2am bed time is going to make tomorrow’s sightseeing a little more difficult but we could come to Montreal and not play up a little! The city of Ottawa was originally named Bytown after Lieutenant-Colonel John By who supervised construction of the Rideau Canal. The 200km canal was constructed to join the Ottawa River to Lake Ontario via the town of Kingston. Construction followed the War of 1812, as the British colonies of Northern Canada feared attack from the United States. They hoped to create a secure supply and communications route between Kingston and Montreal incase of a blockade on the St Lawrence river which forms a border between Canada and the USA. The section of the canal photographed here is directly below what is now Parliment Hill. 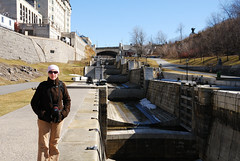 You can see about 8 of the 47 locks, used to raise and lower boats at 24 points along the canal. The canal was completed in 1832, well after the last conflict between the British and Americans so it has never been used for its intended purpose. The canal now is a tourist attraction, particularly in winter when it becomes the worlds largest ice skating rink measuring 7.8km long. When you go to someone’s home you can tell a lot about them by the pictures that are hanging on their walls, so what better way to get an appreciation of Canada by checking out its taste in art! The National Gallery of Canada has three floors covering various styles of art including, but not limited too, Contemporary, European, Inuit and Canadian. The title photo is titled ‘Trans-Am Apocalypse No. 2’ and was featured amongst the Contemporary collection. The Pontiac has been inscribed with the Book of Revelations and stands as the contemporary mode of transport for the apocolyptc horsemen. I shall let you ponder the levels of meaning on this one. 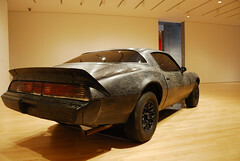 Whilst not my style, I prefered the Maritime inspired Candian art, it did appeal to the rev head within Simon. Of worthy note was Van Gough’s ‘Iris’, painted in 1889, and the Asian stone carvings dating back to as early as the 5th century. My favourite works where the various portraits of early Canadian settlers and the marble statuettes. The gallery is quite large and we did not see everything, however did get an appreciation for the different aspects of Canada’s cultural personality. On the way to museum we stopped and had a look inside the Notre Dame Basilica. Quite a spectacular interior, I’m not sure how the congregation concentrates during mass.